A huge thank you to OFSTED for sharing this with us, particular thanks to Sean Harford and to Oli Baytun. Looking at the charts below the groupings of schools into infant/junior/other are based on the statutory age ranges of each school, rather than the actual numbers of pupils in each school at a point in time. Deprivation is based on the Income Deprivation Affecting Children Index (IDACI) 2015. The deprivation level of a school is based on the mean of the deprivation indices associated with the home post codes of the pupils attending the school - rather than the location of the school itself. The IDACI bands are the same ones that OFSTED show in their published Management Information and Official Statistics. They are calculated based on all primary schools, rather than tailored quintiles produced for each group of schools/each chart. This means that there are different numbers of schools in the quintiles in some of the charts. 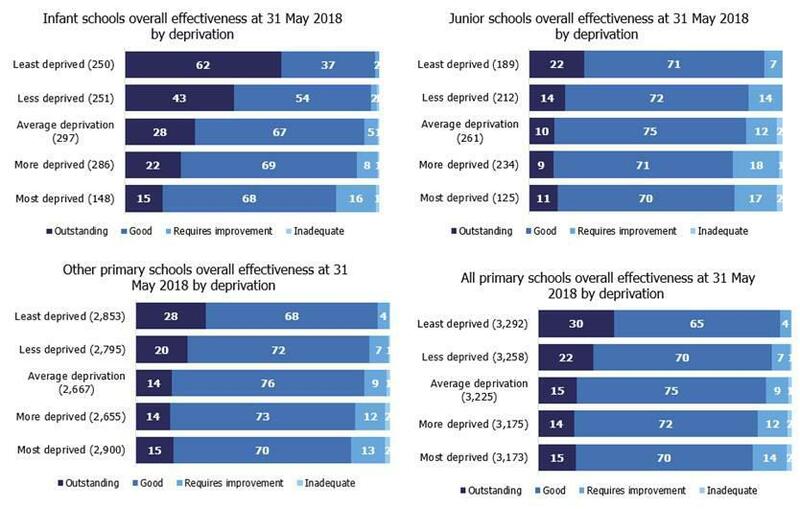 However, OFSTED point out, one advantage of using the same quintiles on each chart is consistency – so if a school is in the ‘most deprived’ band in the infant chart it is also in the ‘most deprived’ band in the ‘all primary schools’ chart. OFSTED point out that following a consultation they have recently changed their methodology for reporting on inspection outcomes in their official statistics data, to include the inspection outcomes for predecessor schools. An update based on the new methodology is coming soon.